Enlighten is one of ten new sculptures that will be installed during May along the ArtRapids! Walk of Art in Elk Rapids. 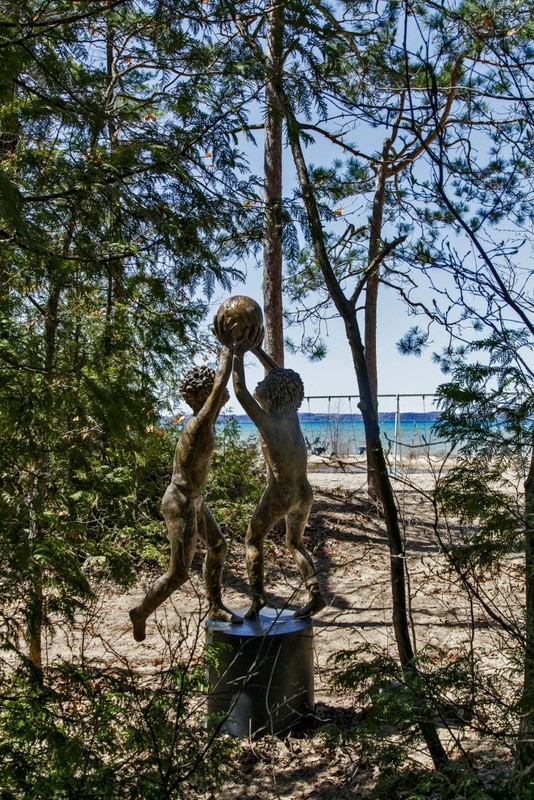 (Learn more about sculptor Margot McMahon and her work here). Miss Sadie, the Cowboy and I encourage you to make the trip. You will find refreshment for your spirit. When you have finished the walk and played on the beach a little, you can meander into the village for an excellent treat. I don’t see how you can go wrong. When I visited the Crystal Bridges Museum, I was surprised to find at least a couple of large (and very fine) scrulptures on their art path were made of resin. I see Margot McMahon works in resin, too. Clearly, there are benefits for communities, both in terms of weight and cost. The artistic vision certainly isn’t compromised — at least in what you’ve shown us here, and what I saw in Arkansas. I’m assuming this will be a permanent installation in Elk Rapids — is that right? It may be that resin’s been used far longer than I’ve realized. I’m off for a little look around the interwebz while I finish my sandwich. I expect an enterprising sculptor can create something astonishing out of almost anything. (Look at Andy Goldsworthy.) This work, of course, is intended to be enjoyed for many years. Several of those years it will spend on the Art Walk; then it will be replaced by something different. ArtRapids! is adding a few pieces each year. Eventually the first ones will be changed out for something new. How pretty! Good for ArtRapids! for their work in brining art to the community! And good for you for letting us all know about it! ArtRapids! has been doing a whole lot of good things, including providing scholarships for Elk Rapids students. We should go for a little walk in the park someday. It would do us a world of good. The only place you could go wrong is to have to head down state on Sunday evening so you can be at work @ 6:30 am Monday!!!!!!!!!!!! I feel your pain. But be of good cheer. You can come back, and the art will still be here. In fact even more of it will be here. And the park is open to pedestrians every single day. I will never reach Enlightenment until you get there and explain it all for me. I will have wander virtually owing to not having the bus fare about me so I hope that you will be my digital guide. It’s only fair after all the digital rides I’ve made with you and Mrs. T.
You realize this week’s WordPress photo challenge is WORK OF ART don’t you? And see how you fit this right in! I wonder if Katie and I could visit this when we’re up at Hartwick Pines State Park early June. I will have to google how far away this is from there. Do they let dogs in the park? Do not follow the challenge – these days it’s all I can do to get online. It must be kismet. Hartwick Pines is wonderful – day trip distance away from Elk Rapids (which is, ahem, just 17 miles south of me). Yes they let dogs in the park. We must discuss all of this further. Right now I’m headed off to another dog-friendly place for the Evening Walk on the Beach. Ah yes, we will have to discuss this.